This article is about the Brazilian poet, playwright and painter. For the Mozambican politician, see Manuel de Araújo. Manuel José de Araújo Porto-Alegre, Baron of Santo Ângelo (November 29, 1806 – December 30, 1879), was a Brazilian Romantic writer, painter, architect, diplomat and professor, considered to be one of the first Brazilian editorial cartoonists ever. He is the patron of the 32nd chair of the Brazilian Academy of Letters. Porto-Alegre was born Manuel José de Araújo in Rio Pardo, Rio Grande do Sul, to Francisco José de Araújo and Francisca Antônia Viana. 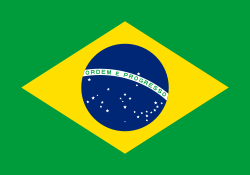 He would change his name to Manuel de Araújo Pitangueira during the independence of Brazil, due to nativist causes. Later on, he finally changed it to its definitive form: Manuel de Araújo Porto-Alegre. 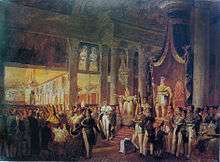 In 1826, he moved to Rio de Janeiro, in order to study painting with Jean-Baptiste Debret at the Escola Nacional de Belas Artes (at the time called the Academia Imperial de Belas Artes). He also studied at what is now the Academia Militar das Agulhas Negras and took a Medicine course and Philosophy. In 1831, he left Brazil along with Debret to Europe, in order to improve his painting techniques. 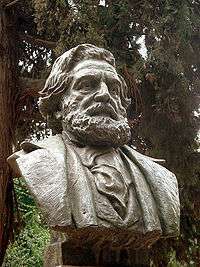 In 1835, he went to Italy, where he met Gonçalves de Magalhães, another Brazilian poet. He and Magalhães would create in France, in the year of 1837, a short-lived magazine named Niterói, alongside Francisco de Sales Torres Homem. Also in 1837, he becomes history painting teacher at the Escola Nacional de Belas Artes, in a post that would last until 1848, when he would become a drawing teacher at the Academia Militar das Agulhas Negras, and starts doing his first caricatures. In 1838, he married Ana Paulina Delamare, having with her two children: Carlota Porto-Alegre (the future wife of painter Pedro Américo) and future diplomat Paulo Porto-Alegre. In 1840 he is named the official painter and decorator of Emperor Pedro II's palace. 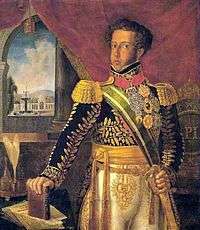 He decorated the imperial palace in Petrópolis, the wedding of Pedro II with Teresa Cristina of the Two Sicilies and the aforementioned emperor's coronation. He was decorated with the Order of Christ and the Order of the Rose. Reuniting with Gonçalves de Magalhães and Torres Homem, he founded a periodic named Minerva Brasiliense, that lasted from 1843 to 1845. He would publish in this periodic his poem Brasiliana. 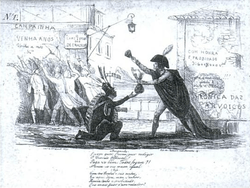 In 1844, alongside Torres Homem, he founded the humoristic magazine Lanterna Mágica, where he published his caricatures. 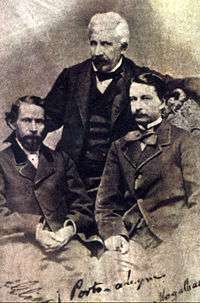 In 1849, Porto-Alegre founded the magazine Guanabara, alongside Joaquim Manuel de Macedo and Gonçalves Dias. The magazine, considered the official journal of the Romantic movement in Brazil, lasted until 1856. In 1852, he enters the political career, assuming a position as a substitute councilman in the Municipal Chamber of Rio de Janeiro, lending service in the areas of urbanism and public health. He would exerce this post until 1854, the year when he became the headmaster of the Escola Nacional de Belas Artes, lasting until 1857. He was proclaimed Baron of Santo Ângelo by Emperor Pedro II in 1874, and was a member of the Brazilian Historic and Geographic Institute. While in Dresden in 1865, Porto-Alegre wrote a letter to Joaquim Manuel de Macedo, then-tutor of Princess Isabel's children, in which he reveals that he became a Spiritist and was able to psycograph messages from the Underworld, and Isabel would ask him "who was [her] guardian spirit". The letter, now being kept at the Brazilian National Archives, has 12 pages. ↑ Além da Vida magazine, 30th edition. Brazilian National Archives, Rio de Janeiro. Wikimedia Commons has media related to Manoel de Araújo Porto-alegre.